From the moment he got on the ballot paper, Jeremy Corbyn was swiftly pigeonholed as ‘the Left candidate’ incapable of attracting the broad support necessary to win the Party leadership. In an act of remarkable short-sightedness all the other major contenders from Kendall to Burnham have acted as if we still inhabit a pre-Collins party, and their approach has been similar to their diagnosis of Labour’s defeat in May: triangulate enough to win over the nebulous and non-existent ‘Middle England’ and victory is assured. On the face of this, Corbyn’s victory would seem implausible. Those of us supporting Jeremy are asking a Labour Party where David Miliband, the continuity Blairite candidate in 2010, won the membership vote and Diane Abbott of the Socialist Campaign Group came a very firm last, to now vote in one of its most leftwing MPs to become leader after a General Election many (wrongly) perceive the party as losing because we shifted too far to the left. For Ed Miliband, what made victory possible was to win over enough of the MPs, secure the unions’ backing, and then not get hammered by the membership. He won with the help of Diane Abbott’s transfers to him, rather than picking up votes in the aisles of Nuneaton’s Waitrose or John Lewis, or wherever else the Blairites claim the British road to socialism is now meant to pass through. Thanks to Ed Miliband, for good or ill, this is no longer the election process – with the MPs weighted vote and trade unionists now asked to ‘opt in’, plus the introduction of ‘registered supporters’. Unfortunately for the Blairites, Middle England are not likely to sign up as registered supporters. So far over 9,000 have signed up, and if social media is much to go by, they are not signing up in droves for Liz Kendall, or for that matter any of the other anodyne candidates. This has prompted a cautious rethink among the Party elite. The Twitterati and chattering classes are now openly questioning whether Corbyn can win. Stephen Bush’s piece in the New Statesman last week is the best example of this, while pollster Peter Kellner is openly mumbling of a narrow Corbyn defeat by Cooper, beating Burnham into third. In the last leadership election, there were 122,000 votes cast in the final round, once all transfers had been made to either Ed or David. Only 9,000 of these votes were first preferences for Diane Abbott, the left’s candidate. Assuming this as Jeremy’s base, and that people are very likely to preference him first or last, he is about 100,000 votes behind winning. This is because those not voting for Jeremy first will probably put him last, giving the other candidates a pool of just over 100,000 votes to transfer between them based on 2010 numbers. For any other candidate, this would be an insurmountable challenge, and would make them a write-off. Of course the party has changed in the last five years. For one, our membership is larger by 45,000, and we cannot be certain of their ideological make-up, plus there are thousands of younger members of the ‘2010 generation’ who have signed up in those five years. Since this year’s General Election, the membership of Labour Students has increased by over a third – and the new members may not share their overlords’ rightwing tendencies. Secondly, there is a new dominant narrative in the Labour Party and the Left of austerity. Labour has spent five years subscribing to the narrative of austerity, pledging cuts after the election, and Jeremy is the only candidate in the leadership election who has very firmly been opposed to this. That is likely to garner him far more support among the party’s base than Liz Kendall’s cries for ‘public sector reform’. There are reasons for caution too. Our defeat at the General Election has led to a new anxiety about whether the party can ever win a majority again, and lots of those who would place themselves on the party’s left may find themselves unable to put a number 1 next to Corbyn on the ballot paper because of a worry that he won’t win over enough Telegraph readers in Swindon, or whatever other barometer the right are now using to measure electability. But crucially for Jeremy, unlike the other candidates, there is a large pool of people outside of the Labour Party who believe that we have deviated from our original purpose, and that Jeremy is the person who represents what Labour used to stand for. The question is, are there 100,000 of them with a spare three quid and an internet connection? I’d like to believe so. The numbers on social media look very strong for Jeremy. His Facebook page has shot up to 30,000 likes in just a short few weeks, already 50% more than Red Labour, which is the largest British socialist organisation on Facebook after the Labour Party itself, while there are almost eight thousand people attending a Facebook event titled, ‘I’m voting Jeremy Corbyn in the Labour leadership election’. The pull of the wider left is even stronger – with 63,000 attending last Saturday’s People’s Assembly demonstration on Facebook – and probably many more in the streets. If half of those anti-austerity voices registered to vote for the anti-austerity Jeremy, then alarm bells would start ringing in Brewers Green. Stephen Bush rightly mentioned the huge figures on the People’s Assembly demo as a potential pool of supporters, while being wildly pessimistic about the attendance based on one aerial photo and Guido Fawkes. But we have to remember many of these don’t come via Facebook, but as part of coaches booked by trade union branches or local People’s Assembly groups. The People’s Assembly and unions now have a huge responsibility to translate their supporters and members into votes for Jeremy – and we should tell them so. Finally, university campuses are another source of votes. Leftwing students can sometimes turn hundreds of people out to vote for candidates in students’ union elections, so they should organise to turn out votes for Jeremy in the leadership election. A few hundred more registered supporters on each campus with a leftwing base could clinch it. Throughout the campaign we must remind each other and those we are persuading to vote for Jeremy that there is a clear route to victory and only our own lack of organisation can prevent this. The Corbyn election campaign could be the best shot the British Left have had in leading a major political party since the days of ‘Benn for Deputy’ in 1981. We are not allowed to miss this opportunity. If every OMOVer thinks he can’t win, then they’ll give old JC their 2nd preference sympathy vote. Tot all those up, plus all the Lefties pushing/actively campaigning/voting for him, then he’s won! And there’s nothing anyone can do about it. And this article shows how that coup de grace can be accomplished. And on 12 Sept we ask: What the hell does the Labour Party do next? Commit suicide. He will be worse than Tony Benn. If he even does well we are finished. Benn was a multi millionaire poseur living in a mansion in Holland Park. He didn’t give a toss about the working class. Perhaps with Corbyn and the re-empowerment of grassroots members, WE (from our life experiences, evidence, and reading) would offer a vision of a dynamic and progressive society (and World). WE, would lead a crusade to build a World of critical thinkers, and try to politicise and empower people through political education. But we would have to become a political party again – we do not have to accommodate citizens as they are, perhaps misinformed by capitalist hegemony (their dominant control of the media/ideas) WE are actually allowed to try to change people, and win them to our ideas. So WE need to try to win the working class and progressive middle class and the general middle class (socialised to vote Tory) but as Owen Jones wrote in an excellent piece recently – the Left needs to support (the often expolited) self-employed and Neo-Liberalism is now coming for the professions, it has taken probation apart, is looking at social work, the legal profession, teachers in HE (plans for hourly paid teachers) and even doctors (physician assistants). I would argue following the tragic death of John Smith we had the SDP coup of New Labour. I would further argue Labour would have won anyway in 1997 and probably in the following 2 elections and whilst there probably would still have been an Iraq war (but with John Smith probably without Britain) we will never know, but if Smith had survived perhaps majorities would have been bigger than New Labour, perhaps we would not have deserted working class communities, cosied up to big business and the banks, had PFI etc.etc. The left has always been about empowerment, equality, economic justice, and more democracy but perhaps we have not always been the best communicators, often using the language of insiders. I have a simple rule – could you take an idea (in the language you use) to discuss on he high street, on an estate, to the workplace? So it is up to the members – empowerment with the Left or the status quo – a top down Labour Party? I believe grassroots, bottom up democracy is the future. Barry, I cannot add a single word that would improve your excellent response. Well said, Barry Ewart. I totally agree that we need to get back to bottom up Labour movement. Do you mean “bottoms up” as in ” It’s your round”? I’ll drink to that! I can, how about writing in the kind of English that the people you want to attract can understand? Not only can he win he must win. If Labour do not elect an anti-austerity, socialist leader they will be as irrelevant in England and Wales as they are now in Scotland. Their fate will be sealed if they sit behind some New Labour clone in Parliament for the next five years trying to out manoeuvre the Tories from the right. But even if he doesn’t win Labour’s left MPs cannot be allowed to simply shrug their shoulders and say `oh well we tried our best’ and let that be an end to it because if they do they will disappear into the trash can of history along with the Labour Party as a whole. 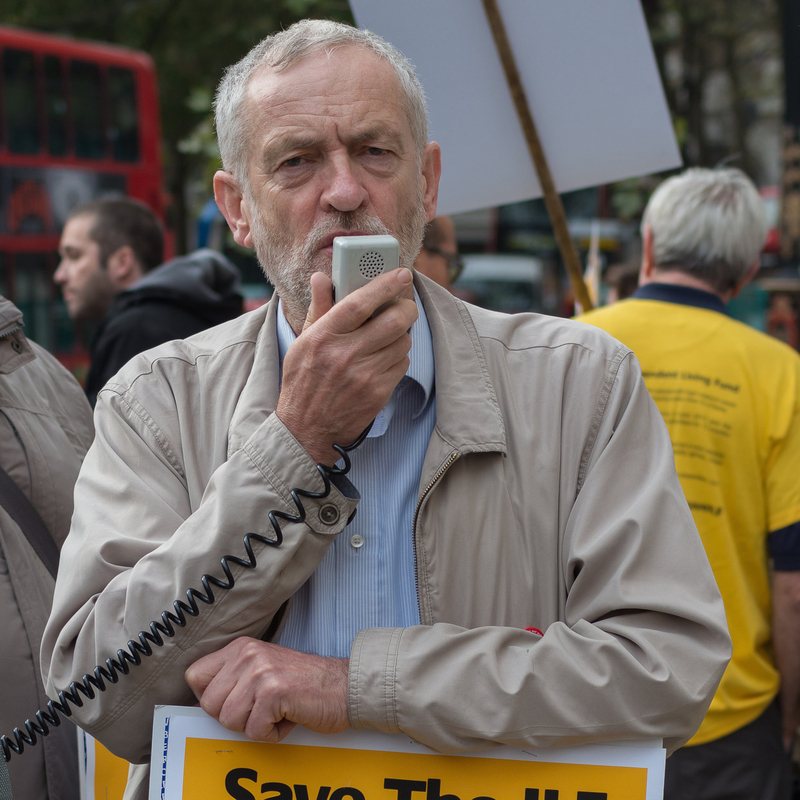 No, if Corbyn does not win the left MPs must form an anti-austerity bloc in parliament that can represent the growing mass movement outside it and offer genuine opposition not just to the Tories but to New Labour’s cynical realism.